On Sunday night’s episode of 60-Minutes, former Florida governor, Democratic U.S. Senator and onetime chairman of the Senate Select Committee on Intelligence, Bob Graham implicated a US ally for their role in the September 11th attacks. “I think it’s implausible to believe that 19 people, most of whom didn’t speak English, most of whom had never been in the United States before, many didn’t have a high school education, could have carried out such a complicated task without some support from within the United States,” says Graham in the interview, implicating Saudi Arabia for thier role in 9/11. Until now, anyone who questioned the highly suspect ‘official’ narrative on the 9/11 attacks has been labeled a conspiracy theorist or a kook. 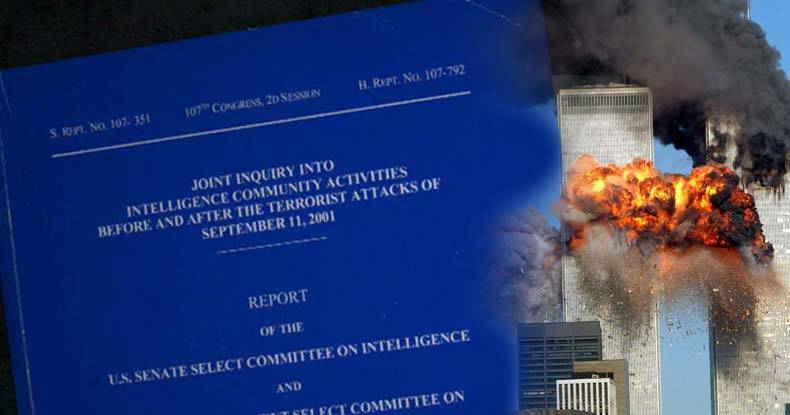 But when current and former members of Congress, U.S. officials, and the 9/11 Commissioners themselves call for the release of these 28-pages, which tells a different story of what happened that fateful day — people will listen — and listen, they did. On Tuesday, after Graham’s appearance on 60-Minutes, he says he received a phone call — from the White House. The Tampa Bay Times then spoke with Graham about that call. Graham told the Tampa Bay Times that Brett Holmgren, a senior policy adviser to the assistant to the president for Homeland Security, told him the declassification review of the documents withheld from a report issued by a Joint Congressional Commission in 2003 will soon be completed. Graham, who asked the president to declassify the records more than two years ago, said he asked how soon he could expect a decision and was told “one or two months.” Graham was co-chairman of a joint congressional committee that investigated the attacks. The 28 pages were classified at the request of the FBI. Graham has been pushing for release of the documents since 2011 when he learned that the FBI had failed to disclose part of its investigation that included reports that high-ranking Saudi Arabian officials provided financial aid and other help to the 19 hijackers who flew airplanes into the World Trade Center and the Pentagon. He says the FBI initially denied there were such reports but has since turned over 80,000 pages in a federal lawsuit seeking the release of all reports on the investigation. “The decision makers at the White House have realized the public cares about it and there is an urgency to come to a decision,’’ Graham said, noting that he appearance on 60-minutes prompted the White House to finally address the issue. For over a decade, the families of the victims have demanded the full story on what happened and have only been met with ridicule and closed doors. This information being aired on mainstream television followed by an ‘official’ response and plan to declassify the information is historical and heartening news to those seeking the truth. Now, we the people may finally receive more insight into the murderous actions on that day, bringing us closer to the closure we so sincerely deserve.